Earlier in the day things had been going well. 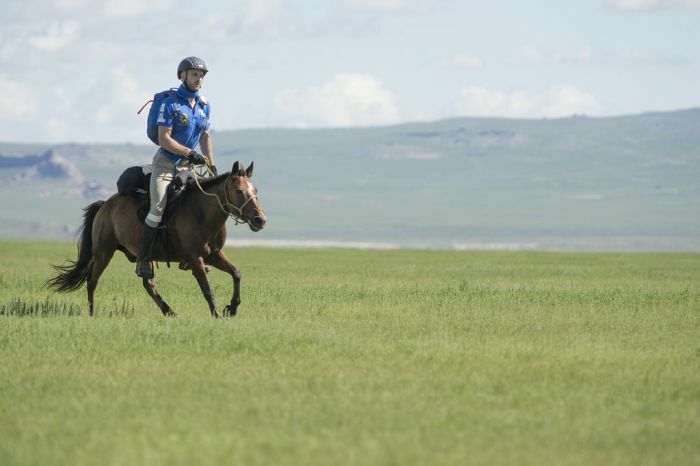 Sarah and I had galloped away from camp on day four of the Mongol Derby, officially the longest and almost certainly the toughest horse race in the world, traversing over 600 miles through Mongolia. The horses we’d been given for the leg were incredible. 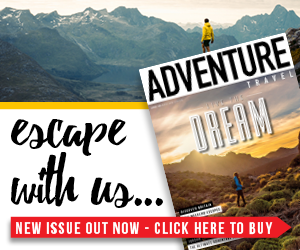 Not only were they breathtakingly fast, but the way they placed their feet amongst rocks, hillocks and marmot holes was beyond belief. We even let the thought that, on steeds this fast we might be able to regain some of the ground we had lost on day two, when Sarah’s horse had decided it wanted to walk the entire 25-mile stage, enter our minds. But once we’d slowed down, and joined two other riders, I made a major mistake. I forgot for a moment that the horses we were riding were still semi-wild. As we stopped briefly to graze the animals, I causally shifted my foot so Sarah could check whether my girth (used to keep the saddle on) was tight enough. The moment my boot touched the horse’s side it did a huge bronc, catching me totally off guard and sending me flying over its head. As I hit the floor I had a split second to decide whether to hold on to horse’s lead rein and risk serious injury or let go and potentially lose the horse. I decided the latter, but instantly regretted it as I watched in disbelieve as, complete with all my gear, the horse span on a six pence and galloped back the way we’d come. Without a second’s thought Sarah asked, “Should I go after it?” Still slightly in shock I said “yes” and watched her disappear in a cloud of dust. Twenty minutes later and there was no sign of Sarah, or either of the two horses, and I was starting to get worried. At the breakneck speeds Sarah had shot off at, a broken leg would probably be a ‘best case scenario’ if she fell and my only connection with the outside world was an emergency button on my tracking device, which all racers where obliged to carry. A few minutes later though, which felt like hours, Sarah appeared on her steed. She explained she’d nearly caught my horse, but after the chase entered a forest and following a close call with a low hanging branch, she’d decided things had got too dangerous. I couldn’t bring myself to call for help though and we decided to walk back for a bit and hope my horse had stopped to graze, offering a potential chance for me to remount. We spotted the horse on a small hill and I watched in awe as Sarah used her horsemanship skills to reign in the rogue horse. That’s when the day’s adventures really began! Now aware that he could buck me off, the next 10 miles of riding where eventful to say the least. I managed to stay on for several episodes with my real life bucking bronco, but came off another three. Aware that if I let go of the reins for a second time the chances were we’d not see the horse again, each time I came off I held on for dear life, even when I fell under the horse and felt hooves coming down on my back and legs. 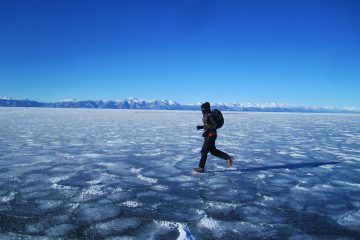 To say I was running on adrenaline when we got into that evening’s camp would be an understatement. When the adrenaline had subsided and I had a chance to reflect on the day, my overwhelming feeling was that of pride. Not with myself for surviving, but with Sarah for the way she unquestionably put her own life at risk to recover my horse. It wasn’t the first or last time, during the nine and a half days racing, that I would look over at my fiancé and simply think, ‘wow’. 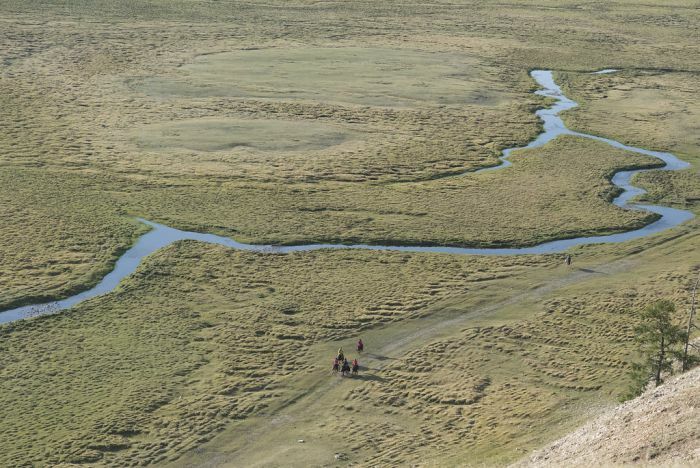 A day after dealing with the bucking bronco, the riding took us through mosquito infested river valleys. That evening when Sarah took off her riding tights I was gobsmacked by the state of her legs. Hundreds of insect bites had swollen up and joined to form one big inflamed mass. By far the worst bites I had ever seen, later in the week they would leave the entirety of Sarah’s hamstrings black from bruising, but not one word of complaint ever left her lips. Nor had it during the first days of racing when temperatures reached 38 degrees, numerous riders had to be put on drips for dehydration and even the race favourite pulled out after she collapsed with heat exhaustion for a second time. Nor later in the race when, in the mountains, we spent a full day in the rain and near freezing temperatures with riders fainting around us from hypothermia. During the whole ten days there was only one moment where Sarah showed any sign of ‘weakness’ and, although it was hard to witness her distress, it was oddly reassuring to be reminded that some of the feminine vulnerability that forms an important part of our relationship was still intact. 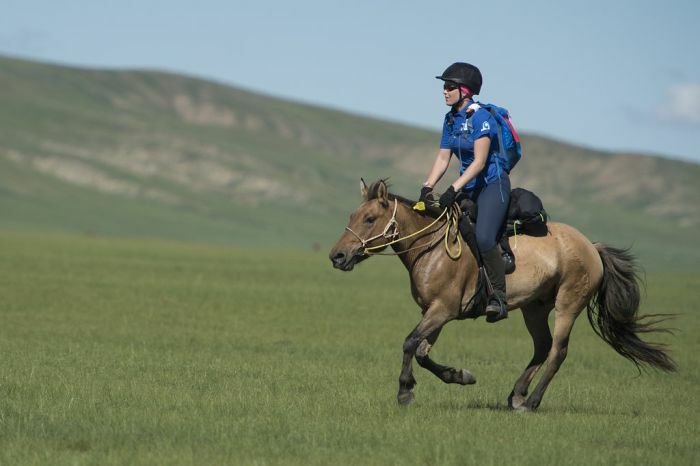 Sarah had been suffering, as many people on the race had, with digestive discomfort and on day six was riding a particularly frisky horse she was understandably keen not to dismount until we reached the next camp. While she managed to grit her teeth for more than 15 miles, eventually she had to ‘quickly alight’ and, still holding onto the reins, let nature take its course. 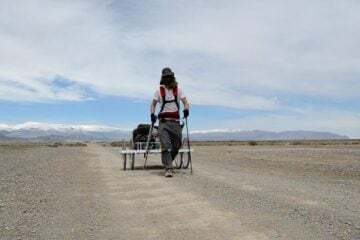 While I didn’t really think anything of it, it clearly affected Sarah and her morale and when we arrived into camp, tired and exhausted 30 minutes later, she shed a few tears – there was clearly a line she hadn’t wanted to cross. The ride wasn’t just about difficult times testing our relationship’s strength however and there were beautiful moments we shared which will stay with us for the rest of our lives. 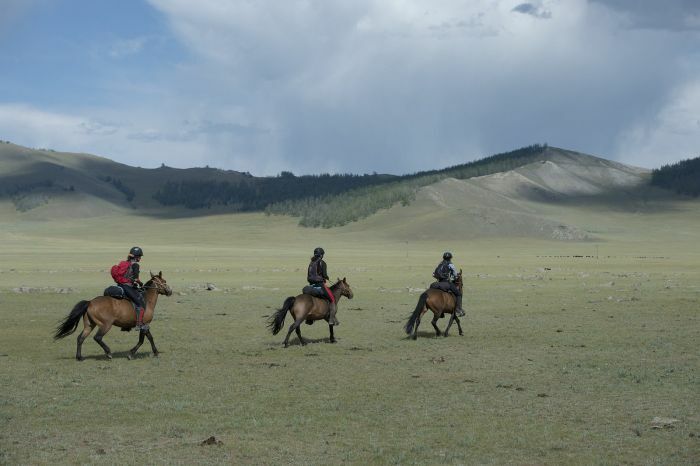 Of the breathtaking sunsets we saw, inspirational nomads we met and stunning horses we rode it was an encounter early on the ride that I will remember most fondly. 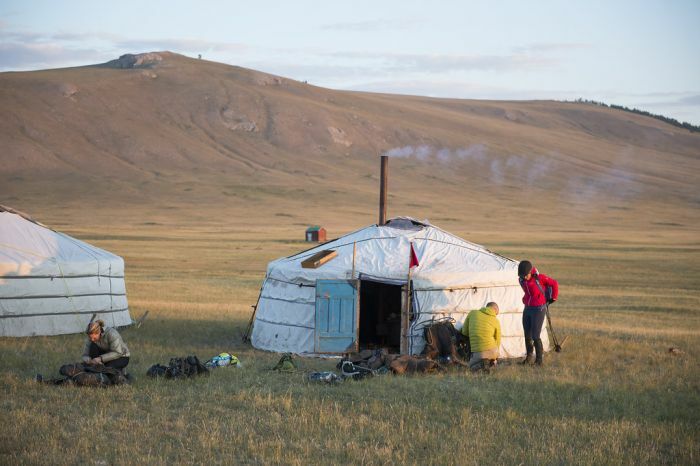 On the first night of the race we didn’t make it to an official camp and instead spent the evening with a local family, whose hospitality I will never forget as they cooked us dinner in their small ger, looked after our horses and made room for us to sleep. 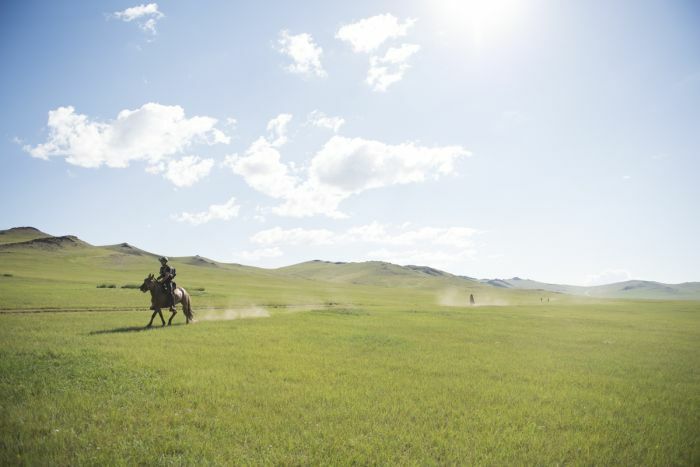 As we rode out of the valley, where the ger was located, the following morning I looked over at Sarah galloping across a picture perfect meadow, with the sun rising behind rolling hills, and felt totally at peace with the world. If I can replicate that feeling just a few times in our marriage I know it will be a very happy one. Doing the race together has not only given Sarah and I an experience we will share forever and acted as an incredible test of our relationship, which I think we passed with flying colours, it’s also the first time in my life, so far filled with personal tests and challenges, that I’ve been able to truly answer the question, am I a strong human being? My own personal hang ups and inhibitions will never let me self-congratulate or acknowledge my own achievements too much, but having lived the world’s hardest horse race alongside my fiancé, seen the hardships she went through, and the incredible determination she showed in doing so, I know I must have ‘done alright’ to complete it alongside her! So only one question now remains for us… what next? Daniel and Sarah were raising money for Azafady and Cool Earth, two organisations that help preserve at risk environments and empower individuals who live there. They would like to thank everyone who sponsored them and kit sponsors Derriere Equestrian, Primal Pantry, Vango and Hy Equestrian. You can donate to their cause by clicking here.